It's hard to imagine our lives without Pinterest ...Would they be less inspired? Less Creative? We think both. At Modern Wedding we love a good pinning session and if you're yet to set up your own account on Pinterest now is the time because today we're launching our very first Pinterest competition and you need to be in it to win it! 1. Follow Modern Wedding on Pinterest. 2. Head to Modern Wedding's website www.modernwedding.com.au and pin ONE image (only) from anywhere on the site onto your own Pinterest profile. 3. When pinning the image, in the pin description area answer the question in 25 words of less - 'Why does this image give you inspiration for your wedding?' Please note if 25 words is exceeded then your pin will not be considered or re-pinned. 4. Email [email protected] with your contact details and your pin URL (just highlight the website address at the top of your browser). 5. Modern Wedding will repin each image onto a competition board on Modern Wedding's Pinterest profile. Competition closes midnight Friday 28th June Australian Eastern Standard Time. 6. Modern Wedding will then judge which pinner wins the competition and they will be contacted and announced on the blog. So if you're starting to worry that your real budget won't cover all the details on your Pinterest board perhaps a saving on your honeymoon will turn a few more pins into reality! The total prize package includes 5 nights accommodation at the Intercontinental Fiji Golf Resort and Spa in a Club InterContinental suite with plunge pool, 2 x beachside cabana massages, Return Private Airport Transfers. Please note airfares are NOT included. Read the terms and conditions below before entering. Check out the Intercontinental Fiji Golf Resort and Spa on Facebook and Pinterest plus read about editor Victoria Black's trip to the luxurious resort on the Modern Wedding Blog! Entry to the competition implies full acceptance of all the conditions of entry including instructions on how to enter. The Publisher's decision is final and binding on all parties. The prize will be awarded to the best entry in order of merit. Chance plays no part in determining the winner. The prize is not transferable and cannot be redeemable for cash. Modern Wedding is not responsible in any way for the prize and the publisher makes no warranties, express or implied, with respect of the prize. The winner will be notified by email and announced on the Modern Wedding Blog Monday 1st July. This is an international competition and open to brides from across the globe. Competition closes midnight Friday 28th June Australian Eastern Standard Time. The winner will be announced here on the blog Monday 1st July. Modern Wedding will decide on the winner. Employees of Wildfire Publishing or any of the prize donor companies are not eligible for entry. You may only enter one pin. 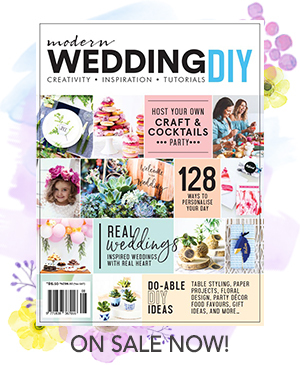 Entries may be published on Modern Wedding's Facebook page to promote the competition. We're eager to see your pins so start pinning! !